In my two Frank Nagler stories, “The Swamps of Jersey,” and the upcoming “A Game Called Dead,” the condition of the city of Ironton, N.J. is as much a character as a setting. The city, a former industrial center, had fallen on hard times and in “Swamps” a hurricane adds to the misery. In “A Game Called Dead” the city’s resident start to fight back and demand action to restore the city. That progression in the stories is expressed through the use of descriptions of sound, or the lack of sound. “But it was the silence that got to Nagler. … A city needed shoppers to make a town center noisy, teen-agers and loud music; cabs and large trucks blocking the intersections and drivers honking their horns and yelling at each other in Spanish or Chinese while they shook their fists at one another while some Irish cop yelled back and pointed to get them back in their cars and move along. “When he arrived at the center, he found the source: A line of twenty or so kids with sticks and mallets and sometimes just their hands playing not formal instruments, but industrial metal drums turned upside down, plastic cans and buckets, window frames lined with tin, make-shift washboards, Mason jars filled with marbles or tiny rocks – anything, everything that could make a sound. Nagler parked his car, got out to lean backwards on the hood, smiled and watched in wonder. “Rafe on lead called out the time and the metal drums rattled to life sending the crisp marching orders bouncing off the brick facades, tickling the windows, blowing past doubts and worries, stepping out in the lead, a clarion call that said, Come down, set aside your troubles, there ain’t nothin’ we can’t fix together. Come they did. The lawn and streets at the center had been filled two hours before the march was supposed to start. When the drums began it was like invisible hands had opened front doors, grabbed folks by the collar of their clothes, lifted them from the breakfast table or from in front of the television and hauled them into the street where their feet started tapping and their faces smiling. 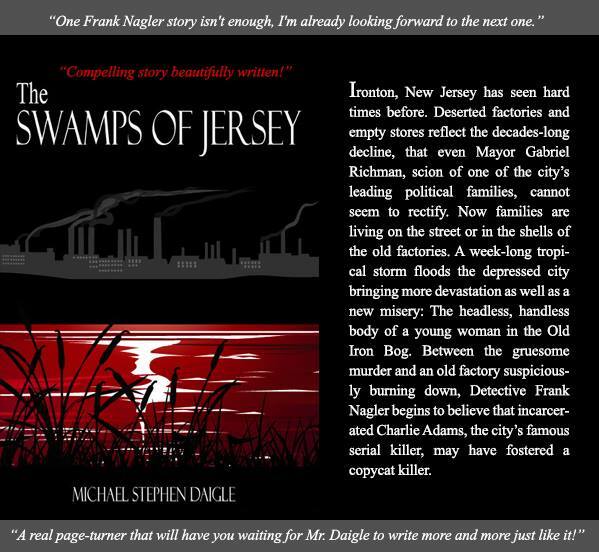 “The Swamps of Jersey” was published by Imzadi Publishing LLC on Nov. 1. This entry was posted in Fiction, Michael Stephen Daigle and tagged "A Game Called Dead", "The Swamps of Jersey" Imzadi Publishing, music, sound. Bookmark the permalink.